LEXINGTON, Ky. (March 5, 2010) − University Press of Kentucky (UPK) author Mark L. Bradley was recently selected as the recipient of the North Caroliniana Society’s 2009 North Caroliniana Book Award for his book "Bluecoats & Tar Heels: Soldiers and Civilians in Reconstruction North Carolina." Bradley will be announced as the award winner at the North Caroliniana Society's annual meeting scheduled for May 21, at the University of North Carolina at Chapel Hill. The North Caroliniana Society (NCS) was established as a private, nonprofit organization in 1975 with the purpose of promoting knowledge and appreciation of North Carolina’s heritage. To determine the winner of the North Caroliniana Book Award, a committee surveys all books published during the year and chooses the volume that it believes "makes a positive contribution and appears to have the best chance of standing the test of time as a classic volume of North Caroliniana," according to the NCS Web site. 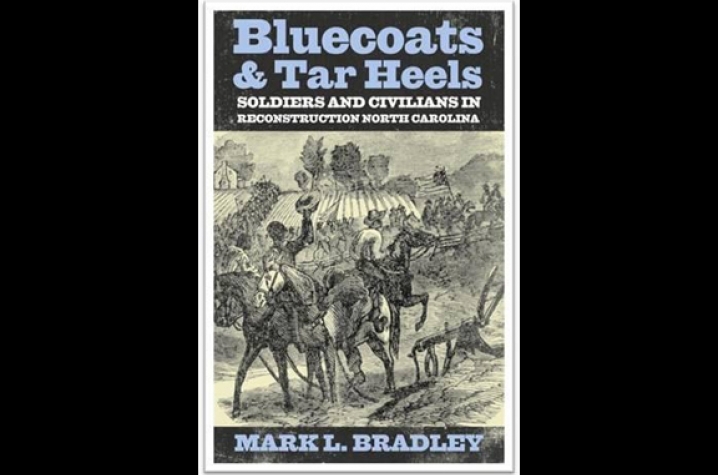 In "Bluecoats and Tar Heels," Bradley tells the story of the U.S. Army’s lengthy occupation of North Carolina after the Civil War, during a time of intense political instability and social unrest. Bradley’s exhaustive study examines military efforts to stabilize the region in the face of opposition from both ordinary citizens and terrorist organizations such as the Regulators and the Ku Klux Klan. While many volumes exist that document the events that transpired before and during the Civil War, this book is one of the few which thoroughly explores the U.S. Army’s role as conciliator during Reconstruction. Bradley, staff historian at the U.S. Army Center of Military History in Washington, D.C., is the author of "Last Stand in the Carolinas: The Battle of Bentonville" and "This Astonishing Close: The Road to Bennett Place," which was a finalist for the 2001 Lincoln Prize.